Planning a memorable event? Then show up in the most memorable way! Prestige Limo, your Bay Area premium Hummer limo service, will help you travel VIP style and class. Your party will turn heads and make onlookers spellbound when you arrive in one of our H2 Hummer stretch limos. These large vehicles can accommodate 18 passengers easily. 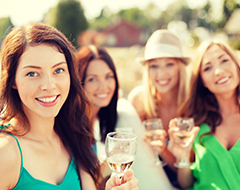 Whether you’re bar hopping through San Francisco, enjoying a Napa Valley or Sonoma Valley wine tour, or celebrating graduation with friends, we offer a number of competitive rental packages for your special occasion. Prestige Limo strives to exceed your expectations with an exceptional level of service for your wedding, bachelor(ette) party, prom, corporate event, concert and sporting event. Our professional drivers will ensure that your ride to and from this special event is safe, fun and memorable. Ready for a night to remember? You can’t miss with the Hummer H2! Grab 18 of your closest friends and get ready to party! With five plasmas TV’s and two fiber optic bars, you can get your groove on before you even pull away from the curb! This is a lavishly lit-up luxury limo. Sit back and relax to the tunes or live it up on the way to your destination. No matter what your plans are, this Hummer H2 is definitely the right choice for your night to remember! Whether you are planning an outing with your golf buddies or celebrating your bachelor party, Prestige Limousine will make your event more memorable. We will custom tailor your experience to your needs and destination of your choice. 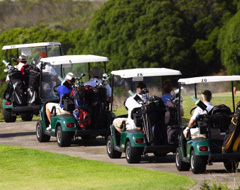 Prestige Limousine will pick your party up in luxury and take everyone to have a relaxing day at the golf course.